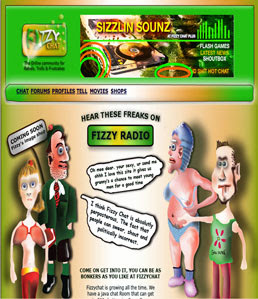 I have created this new site so named fizzychat, It's a site that allow's people to speak freely. I think that to many site are created to appear friendly and safe but thats just an illusion really I think no one is safe and so sites should appear to show the truth from the very start. I am always updating it and looking for new magical things that will entertain home user's of all ager's. I have added a radio, chat applet, forum, shop, news feed, profiles and hope to add more all of the time.